Morgan Davis Foehl made the Black List back in 2009, but none of his screenplays have been produced. Last we heard, I Am Legend screenwriter, Mark Protosevich, had been tapped to write the big screen adaptation of BioWare's Mass Effect. Fast forward a year and Protosevich is gone, in his place is Morgan Davis Foehl, known for his editing work on laugh-a-decade Adam Sandler vehicles, Click and I Now Pronounce You chuck & Larry. Foehl has also edited scripts for TV shows Rescue Me and The loop, and in 2009 he made the Black List with Whatever Gets You Through the Night. The Black List lists the best screenplays which didn't get picked up by a studio. Therein lies the problem, despite his noted talent, none of Foehl's screenplays have ever made it to release. "Producers sparked to Foehl's take on the project, given that he is a Mass Effect fan, but also has penned action pics with a strong espionage bent, something that factors into the overall plot of the Mass Effect games," according to Variety. CEO and founder of Legendary Pictures, Thomas Tull, and vice president, Joe Jashni, are set to produce the film, alongside Avi and Ari Arad. The Arads are also trying to get Uncharted, InFAMOUS and Metal Gear Solid movies off the ground. Their most recent venture into game movie territory was 2007's Bratz: The Movie . Bioware co-founders Ray Muzyka and Greg Zeschuk were supposed to serve as executive producers alongside Casey Hudson. That seems unlikely now they've said their goodbyes to BioWare and, apparently, the entire games industry. 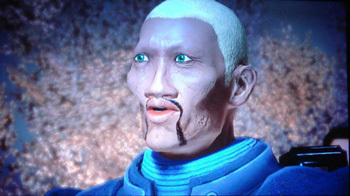 Personally, I can't say I'm holding out too much hope for a good Mass Effect film. That the producers can't even figure out who's going to write the movie casts some serious doubt on their ability to cast the correct actor as bipolar, omnisexual, space hermaphrodite, Commander Tiddlywink Shepard.